2. In large bowl, combine brown sugar and butter; mix well. 3. Beat egg and vanilla into butter mixture, add cocoa and mix well. 4. 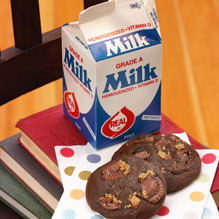 In separate bowl, stir together flour and baking soda; add to batter alternately with milk. 5. Fold Reese's® Peanut Butter Cups into mixture. 6. Lightly butter two cookie sheets. 7. Drop tablespoons of dough onto cookie sheets and bake for 12 to 15 minutes.